I love blogging. It took a while to find my voice and a good rhythm, and now I have it has become something I really enjoy. I like being part of the blogosphere. Even if it’s just on the edge and what I do is mainly lurk. I read blogs about writing by people who write and who have varying degrees of publishing success. Other blogs I read are about books, feminism, privilege and prejudice, paganism, pop culture, astronomy, body positivity and some other random stuff. Occasionally I comment. I love it when people comment here. Then there are memes and challenges. Make a list of something? Brilliant. Get ideas for blog posts by doing challenges? Awesome. When I started blogging two and a half years ago I was looking for the discipline of writing regularly despite all the other demands that life has. To start with my posts were very short. I couldn’t think of anything to say that someone else might want to hear, or that hadn’t already been said by someone else. Gradually, I got over being shy and embarassed about my writing and for the last six months or so, my posts are longer and more detailed. I like to think that I’m a better writer because of it. I’m certainly more confident and that’s no small thing. I was excited to read The Painted Man by Peter V. Brett. There’s been a lot of buzz around it and I like the cover a lot. There are three point-of-view characters; Arlen, Leesha and Rojer. We meet them when they are children and follow their stories through to their mid to late twenties. In the book demons come out at night and they can’t be fought, partly because they are so numerous, so humanity hides behind warded walls. But still, many people are lost to the demons, including the families of Arlen and Rojer. The damage done to Leesha is done by other people. After the formative events of their childhood are described, they each leave their home village in search of a way to fight what happened to them. Each finds they have special skills: Arlen learns to fight demons by tattooing wards on his body; Rojer can charm them with his fiddle and Leesha is a talented healer. Towards the end of the book, their paths converge and they fight a pitched battle against the demons. This is a book with a theme. It’s about how people respond to fear and what it does to them. Which is a good theme, but it’s very obvious and sometimes it feels like the story takes a backseat. That’s a shame, because there’s a good story in here. Although I suspect it might be in the second book of the series. What this really felt like was backstory. Here are three characters who are going to form an amazing demon-fighting team who I think I would like to see ridding the world of demons, but I have to wait for a whole book while we set up their motivation. Also, the worldbuilding is quite poor. At the level of detail, it’s ok. Villages and individual buildings feel quite solid. The problem is at the macro level. The various city-states of this world are one dimensional in terms of economy and culture. The latter is particularly problematic as the references to real-world culture are too clumsy. Here’s a city in the desert, so we’ll basically make them arabs but without any depth of understanding of arabic or Islamic culture. The other four cities are generic medieaval European templates. It all felt a bit paint-by-numbers. Not that this isn’t a fine tradition in fantasy, but getting the worldbuilding right is one of the elements that separates great fantasy from the rest. Anything that get’s published has something about it; something that caught the imagination of an editor. So, what was it about this book? From the small biographical details available, I don’t believe that the answer is ‘connections in the industry’. It’s a debut novel, so we can rule out previous sales history. I think it comes down to story. I like the concept. It’s an interesting twist on the ‘farmboy becomes hero’ trope. I wanted to read what seems to have been held over to book 2. Perhaps reading the rest of the trilogy and viewing it in the whole will make more sense. One thing to take away from this book is about making choices about what to show. For all of the characters the books covers fifteen years and so Brett has to choose which events he shows and which he summarises. He has to pick out a number of scenes and events that represent the formative experiences of the characters. I’m not sure I would have made the same decisions in all cases. If you fancied reading this, then you might be better off skipping straight to the second book. I like to analyse stuff. This week I have some time off from my day job and I am working on my novel. For me, this means looking at the 65,000 words of scenes that I have and trying to work out in what order they should go. So I have scene cards and a spreadsheet, and I finally worked out what the damn thing is about, and I’m trying to get it all together. Writer-friends of a less analytical bent say I should worry less about this kind of detail and just write and then everything will just fall into place. Not for me it won’t. Or at least, it might, but it won’t be as effective as it will be if I do it deliberately. Analysis leads to mindful practice. To learn how to write you need to write. 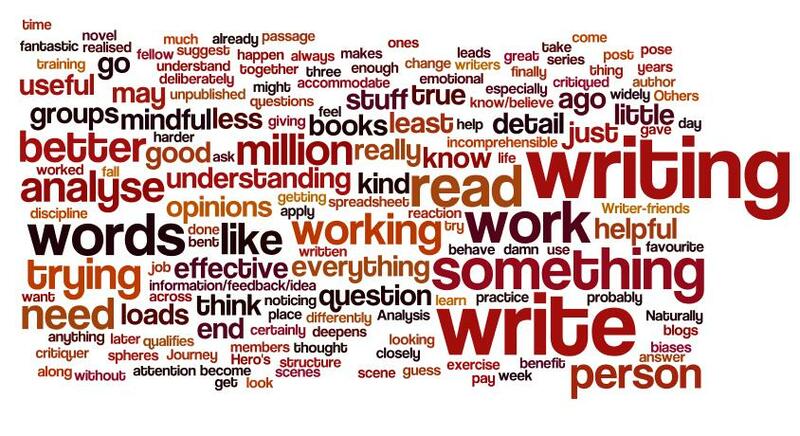 I read a little while ago that you need to write a million words at least. And that is probably true but, like training to become better at anything, it will be more effective if you are mindful of what you are doing. You could write a million words and will be a little better at writing at the end of it without giving it any thought. But if you pay attention, and analyse what you’re doing, the million words will work harder for you and you’ll be much better by the end. Who said it? What qualifies them? What do I think of their opinions? What biases do I know them to have? How do I feel about what has been said? If I have an emotional reaction of any kind, but especially a negative one, then this is something to look at very closely. How does it fit with what I already know/believe? Is it something that deepens my understanding? Is it something that challenges my understanding? How can I use this information/feedback/idea? Is there enough detail here for me to apply it? How would I change my writing to accommodate it? What direction will it take me in and is that where I want to go? How will this help me improve? I also do critiquing for other members of my writing groups and I realised a couple of years ago that the person really getting the benefit from the exercise was me. Looking at the work of a fellow unpublished author, noticing what was working and what wasn’t, along with the discipline of trying to suggest how it could be done differently, gave me a great opportunity to understand what I was doing with writing. Naturally, when you come across a passage that isn’t working you think about how you would have written it. This may or may not be useful to the person being critiqued, but it is certainly useful to the critiquer. My favourite question is why? It always has been and is true in all the spheres of my life. Why did something happen? Why did a person behave like that? I need to know. And I guess that’s why I write – to pose the question and explore the answer. I try to read as widely as possible and sometimes that means reading things I don’t think I’m going to like. Things I don’t think I’m going to like include romance novels, especially Mills & Boon. However, there is something to be learnt from reading these books, namely ‘how to create emotional intensity through internal monologue’. A Noble Captive by Michelle Sykes is a historical romance set on the edges of the Roman Empire in 75 BC. The captive in question is a Roman tribune, a contemporary of Julius Caesar, who is captured by pirates in the Mediterranean and taken to the island temple of Kybele. The story is inspired by the capture of the young Caesar by pirates although the ending is significantly less bloody. The heroine is the assistant priestess, struggling to keep the temple going financially and spiritually while the sibyl is unwell. She is trying to walk a tightrope between political factions she doesn’t really understand. Actually, there’s a good deal more plot in this than in the other Mills & Boon I’ve read. Although that doesn’t mean there’s a lot of plot. There’s a sprinkling of solid historical detail but this is undermined by a lack of rigour in other areas. For example, tribune was a very high office but in this book it comes across as not much more than a centurion. So, yeah, there’s not much to say about this. It was fairly fluffy and not as annoying as previous Mills & Boon have been (does that mean I’m getting indoctrinated?? ), but there’s little to recommend it. Gridlinked by Neal Asher is essentially James Bond in a space opera setting. Ian Cormac has been an agent for Earth Central Services for thirty years and has been linked to the AIs that govern the Polity for all of that time. His latest mission involves coming off the grid and learning to problem solve like a human as the AI network is potentially compromised by an alien intelligence from beyond the galaxy. In order to deal with this he is pulled off his current mission (which is not going so well) but not before he’s killed the sister of a psychotic terrorist. Who then proceeds to chase Cormac across the galaxy generally getting in the way until the final confrontation. The book is filled with a cast of engaging characters, both human and AI. Cormac’s adjustment to life without access to the AI grid, without all the information he could ever want, is convincingly portrayed. The moments when he has to ask other people about themselves and realises how much he has forgotten about making a connection are poignant and well-handled. The dialogue is crisp. The pacing is good; it’s a 125,000 word novel and it packs much more in than you’d think. The twin strands of the plot are balanced nicely and even right at the end the possibility that everything will go horribly wrong is strong. There are points when Cormac is talked about by other characters and we learn that he is somewhat legendary. Yet he comes across as a relatable character. He’s not legendary in his own mind and he doesn’t have the disrespectful arrogance of James Bond. I really enjoyed this. I’ve bought another one and I’m looking forward to reading it. If you haven’t read Neal Asher before, I’d recommend him. Oh my, what a bust. The London Book Fair was big and busy and I came away feeling positive about the state of the publishing industry. I know it’s a trade fair and it’s not really for authors, but the website said there was an author lounge where unpublished authors could talk to literary consultancies, the Arvon Foundation and self-publishers. When I got there it was the most pokey, grubby, scoddy little corner that looked completely unloved and appeared to be full of vanity publishers. If I’d read Book Fair Bewares beforehand I might not have been surprised. So, I took myself to lunch on the Embankment, wandered around Covent Garden, walked up to Watkins Books in Leicester Square and then onto Foyles bookshop on Charing Cross Road. Then I went to my writers’ group in the evening. I had a wonderful day. I’m going to the London Book Fair today. For the first time. Where I will wear a badge proclaiming that I’m an author and I will probably be too shy to talk to anyone about my work. I will post my adventures later in the week.